I find myself getting lost for hours on Pinterest, especially in the food and drink category. I'm forever pinning recipes and mouthwatering delicacies that I say I will one day attempt. In a series I’m calling PinCookery I’m going to start attempting some of these sweet snacks and delights that I’m forever salivating over! I’m a sucker for sweet potato fries - if they’re on a menu you can guarantee I’ll be ordering them. Some of the best I’ve had recently where at Frederiks! I looked into buying some cook at home frozen sweet potato fries but at £2.50 a bag containing 2 servings…it was a no go! Peel the sweet potato then cut into quarters. Cut each quarter into 3-4 slices, then each slice into 3-4 fries. Put your fries into a mixing bowl and add the extra virgin olive oil, along with a generous amount of sea salt, black pepper and paprika (to taste). Toss vigorously until all your fries are evenly coated. Line a baking tray with greaseproof paper and lay them out in rows. With the oven pre-heated to 200°C put your fries on the top shelf and set a 20 minutes. After 20 minutes, take your fries out and turn them over, then put them back in until crisp and golden, around 10 - 15 minutes. I slightly over-cooked my sweet potato fries so they were a little extra crispy on the edges and one or two had been incinerated but on the whole, they all cooked really well. Crispy on the outside but soft inside. The paprika gave them a really great kick too! 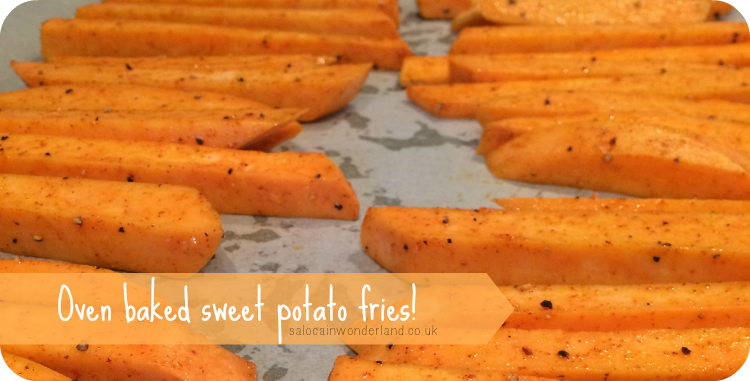 They take a lot longer than regular frozen fries but they taste a lot better - and are a healthier option too! They must have been good - Mr has never liked sweet potato but he devoured half of these, he’d have had them all if I hadn’t have run off with my share! Have you ever tried cooking a Pinterest recipe? Let me know in the comments below! Omg yes! That's it, I'm have sweet potato fries for tea tonight! These look amazing!! They're so good! I'm starting to get a little obsessed with them! Cooking them for longer is certainly the key, just not too long or they burn up really quickly! 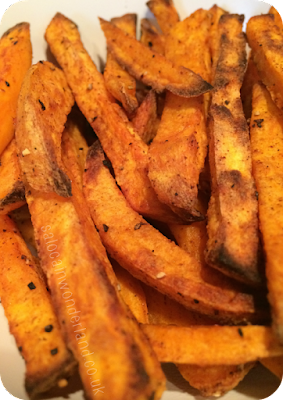 Sweet potato fries are my favorite kind of fries! I always order these over regular ones, yet I will have to try prepare these myself, I bet it's really easy! It's so much easier than I thought and they came out so well, I'm about to whip up another batch!